An incredibly influential Russian painter, Wassily Kandinsky (1866 – 1944) was given credit for painting the first abstract pieces. Known for geometric as well as expressionist paintings, Kandinsky artwork evolved a lot over his lifetime. At Affordable Art 101, we offer an impressive and large Kandinsky print collection – including hard-to-find lithographs and woodcuts inspired by Kandinsky paintings. In particular, we have a limited edition silkscreen which is signed by Kandinsky’s widow, there are only 300 of these particular signed Kandinsky silkscreens in existence. Medium: original color woodcut. Catalogue reference Roethel 79. Published in Paris in 1938 for XXe Siecle (No. 3). Image size 6 1/2 x 6 inches (165 x 153 mm), with full margins. Signed in the block (not by hand). A beautifully printed, richly inked impression with strong, fresh color. Condition: there are a few spots of foxing (not affecting the image). There are six pinholes along the left edge of the sheet -- this is from the publisher's original binding staples, and also serves to demonstrate the provenance of this work. Medium: original woodcut. Catalogue reference Roethel 111. Published in Paris in 1938 for the rare XXe Siecle (issue No. 3). Image size 6 1/2 x 8 1/4 inches (165 x 213 mm), with full original margins. Signed by Kandinsky in the block (not by hand). Condition: there are pinholes from the publisher's original binding along the left edge of the sheet. Medium: original woodcut. Catalogue reference Roethel 145. Published in Paris in 1938 for XXe Siecle (issue No. 3). Image size 7 x 8 1/2 inches (170 x 218 mm); with full original margins the sheet measures 12 1/2 x 9 1/2 inches (318 x 242 mm). Signed in the block (not by hand). Condition: there is minor foxing and age-toning. There are six pinholes along the left edge of the sheet -- this is from the publisher's original binding staples, and also serves to demonstrate the provenance of this work. Medium: lithograph (after the drawing). Printed in 1957 for XXe Siecle(issue number 8) and published in Paris by San Lazzaro. Sheet size: 12 3/8 x 9 1/2 inches (315 x 243 mm). Signed in the plate, not by hand. Wassily Kandinsky "Motif aus Improvisation 25: The Garden of Love"
Medium: woodcut (after the original woodcut executed for “Klange”). Catalogue reference Roethel 105. A nice impression on wove paper, issued in 1959 for the hard-to-find Christmas issue of XXe Siecle (No. 13), published in Paris by San Lazzaro. Image size 8 1/2 x 8 3/4 inches (217 x 220mm). Sheet size: 12 1/4 x 9 1/4 inches (315 x 235 mm). Signed by Kandinsky in the block (not by hand). 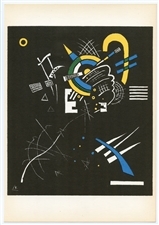 Wassily Kandinsky lithograph "Tableau avec formes blanches"
Medium: lithograph (after the painting). 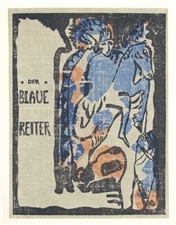 Printed in Paris in 1962 for Derrière le Miroir for "Der Blaue Reiter" issue (No. 133-134) and published by the atelier Maeght. Image size: 15 x 17 1/2 inches (380 x 445 mm); the sheet size is 15 x 22 inches (380 x 560 mm). There is a center fold and text on the back side, as published. Signed in the plate (not by hand). Medium: lithograph (after the drawing). Printed in 1957 for XXe Siecle(issue number 8) and published in Paris by San Lazzaro. Sheet size: 9 1/2 x 12 3/8 inches (243 x 315 mm). Signed in the plate, not by hand. Medium: original color woodcut. Catalogue reference Roethel 122. The translation of the German title is "Mountains". 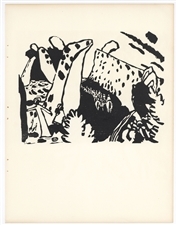 This edition was printed for XXe Siecle in 1966 (issue number 27 "Centenaire de Kandinsky"). Image size 4 5/8 x 6 7/8 inches (120 x 175mm). Printed on smooth wove paper. Signed by Kandinsky in the wood block, not by hand. Condition: the margins have been trimmed slightly, not affecting the image. 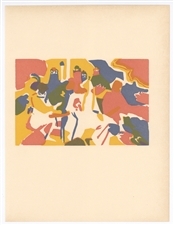 Wassily Kandinsky original woodcut "Orientalisches"
Medium: original woodcut. (Catalogue reference Roethel 106). This woodcut was printed by XXe Siecle on Arches paper (posthumous printing). Image size 4 7/8 x 7 1/2 inches (125 x 190 mm). Not signed. 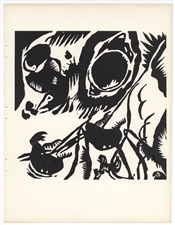 Wassily Kandinsky original woodcut "10 Origin"
Medium: original woodcut. (Catalogue reference Roethel 203). This woodcut was printed by XXe Siecle on Arches paper (posthumous printing). Image size 8 1/4 x 6 1/2 inches (210 x 168mm); the total sheet measures 12 x 9 1/2 inches (310 x 240 mm). Signed by Kandinsky in the block (not by hand). 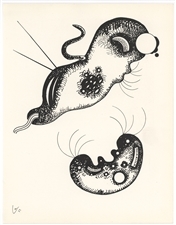 Wassily Kandinsky lithograph "Kleine Welten II"
Medium: lithograph (after the original). Printed in Paris in 1954 by Mourlot and published by Berggruen for a scarce catalogue. Image size: 4 1/2 x 4 inches (115 x 97 mm). There is another lithograph printed on the back, as issued (the ink from the back shows through the paper somewhat). Signed in the plate (not by hand). Medium: lithograph (after the woodcut). Printed on thin wove paper and published in Stockholm in 1956 for a Swedish survey of Concrete Art. The full sheet measures 10 1/2 x 7 1/2 inches (270 x 190 mm). Signed in the plate (not by hand). Condition: there is some surface wear; and creasing near the bottom left corner of the sheet. Medium: lithograph (after the drawing). 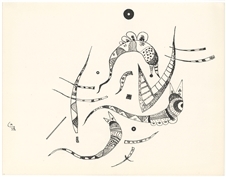 This impression on heavy wove paper was published by Maeght in 1951 for the back cover of a scarce volume on Kandinsky by Max Bill. The image size is 3 1/2 x 4 1/4 inches (82 x 110 mm) and the sheet measures 9 x 7 3/4 inches. Signed in the plate (not by hand). 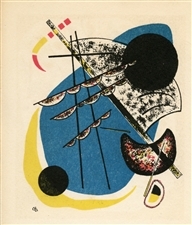 Wassily Kandinsky lithograph "Kleine Welten IV"
Medium: lithograph (after the original). Printed in Paris in 1954 by Mourlot and published by Berggruen for a scarce catalogue. Image size: 4 1/4 x 4 inches (105 x 100mm). There is another lithograph printed on the back, as issued (the ink from the back shows through the paper somewhat). Signed in the plate (not by hand). Whether you’re an enthusiast of Expressionism art or simply a print collector, browse our selection of Kandinsky artwork to round out your current pieces. We also carry a large and affordable selection of Pablo Picasso prints, Chagall prints and many more influential artists. We’re constantly updating our inventory, so check back often!